At Van Otis Chocolates, we love to share all the pleasant memories that come with enjoying our tasty treats. Whether you're taking a tour of our factory and seeing what our chocolatiers accomplish behind the scenes, or enjoying a class to learn to make some of your favorite confections, our team is here to help share their love of food. To purchase tickets, please click here. Caramel Madness: Participants will learn how our delicious, creamy caramel is made, and will learn how to cut caramel and dip it in chocolate - and even take some home. Thursdays 5:30pm-6:30pm. Chocolate Overload: Are you a chocolate fanatic? If so, this class is for you! During this hour long class, you will learn the basics of tempering chocolate, make a chocolate ganache filling, and prep, fill, and cap molds. You will then get to decorate and pack up your treats to take home with you. Tuesdays 5:30pm-6:30pm. Truffle Making: Come take part in our hands-on truffle making classes right here at Van Otis Chocolates, which run every third Saturday of the month (except December, March, and April) from 9am-1pm. We can accommodate groups ranging from 10-25 people. Tours normally take an hour, but you will want to allow some time for browsing in our candy and gift store. Tours are appropriate for ages 8 and over. 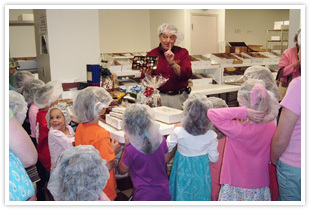 Tours cost just $8.00 per person, which includes a fun candy making activity and of course, delicious samples! Reservations are required for all tours year round. At least 1 week's notice is required to schedule a tour. Tours typically run Monday through Friday between 10am and 3pm. We do not conduct Tours during special Holiday dates. We do not accept walk-ins or same day calls for tours or classes. Please give us a call at 603.627.1611 for more information and reservations or just fill out the form below.